A delegation of the Ugandan Parliamentary committee on Budget, on Tuesday 23rd October 2018, paid a working visit to the Northern Corridor Secretariat to get a glimpse of the Northern Corridor achievements and performance in general; and share more insights on how regional National Parliaments can contribute to a quicker integration process and promote a two way trade that may reduce significantly the existing imports-exports deficit in the East and Central African region. In its endeavour to fast track the implementation of the Single Customs Territory program, the Ugandan Parliamentary Committee on Budget undertook the visit in Mombasa to familiarise itself with what was going on at the Port with regard to the implementation of the Single Customs Territory programme and to get more details on the Achievements and Performance of the Corridor. “National parliaments in the Northern Corridor region should be engaged and consequently involved in all efforts to promote trade and regional integration; especially committees on Trade, Infrastructure, Finance, Planning, legal and foreign affairs”, urged Hon. Amos LUGOLOOBI, Chairman of the Ugandan Parliamentary Standing Committee on Budget, whose delegation was on a fact finding and spot assessment of the Single Customs Territory operations at the Port of Mombasa, Kenya. 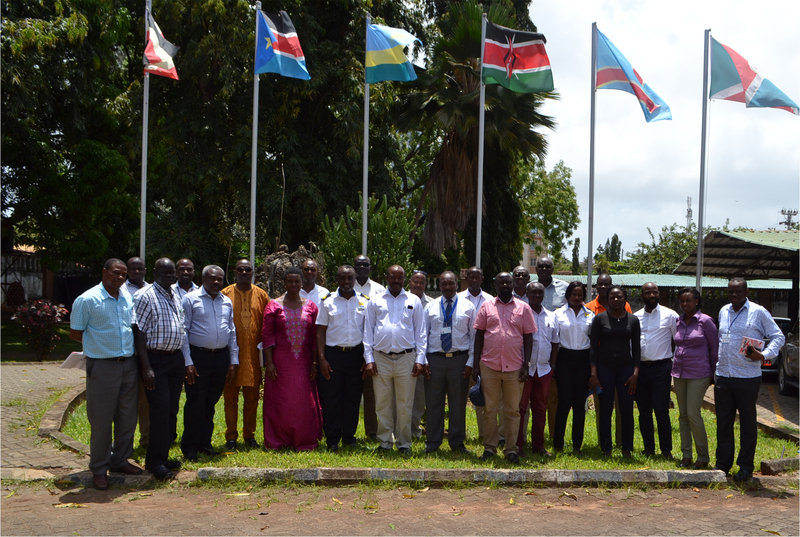 Members of the Ugandan Parliamentary Standing Committee on Budget and NCTTCA Staff during their fact Finding Visit in Mombasa, on 23rd October 2018. The delegation of the Ugandan Parliamentary committee on Budget, on Tuesday 23rd October 2018, paid a working visit to the Northern Corridor Secretariat to get a glimpse of the Northern Corridor achievements and performance in general; and share more insights on how regional National Parliaments can contribute to a quicker integration process and promote a two way trade that may reduce significantly the existing imports-exports deficit in the East and Central African region. “It is a privilege to have you visiting us”, said Omae Nyarandi, Executive Secretary of the Northern Corridor Transit and Transport Coordination Authority (NCTTCA), “It is more encouraging. We are sure parliaments will continue to play a crucial role not only in oversight of the integration process but also in understanding the need to open up the regional markets and business opportunities and adequately allocate sufficient budgets on priority integration projects”. The Ugandan delegation commended the success stories on the performance of the Northern Corridor and positive results of the Single Customs Territory. The Members of Parliament assured to closely make a follow up on some outstanding challenges such as high Transport Costs, empty return trips by trucks after offloading imports, high visa costs for citizens from the region, underdeveloped growth centres, non- harmonized road user charges, challenges of regional trade and transit facilitation agents to obtain work permits, inadequate infrastructure development hampering intra-regional trade. In this regard, NCTTCA’ hosts have shown their interest and support to the 940 km road project between Mbarara, Uganda and Kisangani, DRC via Mpondwe which is a key road that is part of the 6,000 kilometres Trans-African Highway from Lagos to Mombasa, at the same time it connects one of the endowed resource areas. The Trans-African Highway, the ambitious grand project launched in 1971 is supposed to comprise of nine (09) interconnected highways that would cover 60,000 kilometers across the continent. So far, the Trans-Sahelian Highway, which runs 4,500 kilometers between Dakar in Senegal and N’Djamena in Chad, is the only highway out of the nine that has been completed. The Port of Mombasa is very strategic to the Ugandan economy with more than 90% of Ugandan imports and exports transiting through the Kenyan Port.